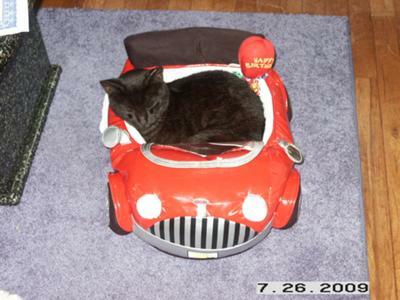 Wolfie was born August 17th of 2003. He was a very small runt and I rescued him along with his brother Fawkes. He was so special to me because I feel he was my forever cat reincarnated that I lost a few months before finding Wolfie. They were so alike it was very strange. He was a great cat - very strong, and over the past year developed a very special bond with my daughter who is 9. He was just like a dog doing everything with her. He was all black but had gray stripes underneath. He would come in at my daughter's bedtime and sit and watch her take a shower, brush her teeth and he would wait for her to get into bed, and snuggle with her every night until she fell asleep. He passed away Monday morning May 17th. He went outside and had a massive seizure and heart attack and was gone in a few minutes. He would have been 7 this summer. We miss him so much and he will be a forever cat in our lives. Love and Miss You Wolfie, forever. Sorry to hear about Wolfie, sounds like he knew what a good home was over the years and had a great person to take care of him. I'm very sorry to hear about Wolfie, Melanie. He obviously had a great home!